When I first moved back to Kentucky in 1994 and took a job with the state as a craft marketing specialist, I was faced with a certain dilemma. My job was to help craftspeople market their work in regional, national and international markets. I came to meet so many fantastic artists and was exposed to some of the most beautiful artwork in the world, and I wanted to buy all of it. I quickly learned that would not be possible. Even though I was gainfully employed, our two boys qualified for free and reduced lunches at their school. Things got better financially once my wife found employment, but the desire to buy art I could not afford didn’t leave. I decided since there were so many beautiful things to choose from, the only way I could curb my desire was to choose one particular thing that I was most attracted to and limit myself to collecting one piece at a time. I decided on Kentucky folk art roosters. My first purchase was a rooster by Ronald Cooper, and I paid $40 dollars for it. As my colleagues and I went out recruiting craftspeople at local fairs and festivals I met many artists who created roosters, and I would buy one piece at a time. I also started buying at Kentucky Crafted: The Market. As years went on, I could afford larger pieces and have built quite a collection. At last count I think I have 25 roosters. I really have no idea of their value but they are precious to me. On one hand, I think they may have appreciated quite a bit. On the other, they might not be worth that much, because our boys did quite a bit of roughhousing growing up and more than one rooster fell flat on his face. As an art collector, I can proudly boast having the world’s largest collection of Kentucky folk art roosters…with broken beaks. Most art collectors actually start before they have the means to do so. They collect because they love the work, not because they think it will be a good investment. Are there art collectors out there who would like to share their experiences with the readers of Creative Commonwealth? Are you ready to take the first step to start the collection you desire? I’m new at this Facebook thing, so trying to get the hang of it. 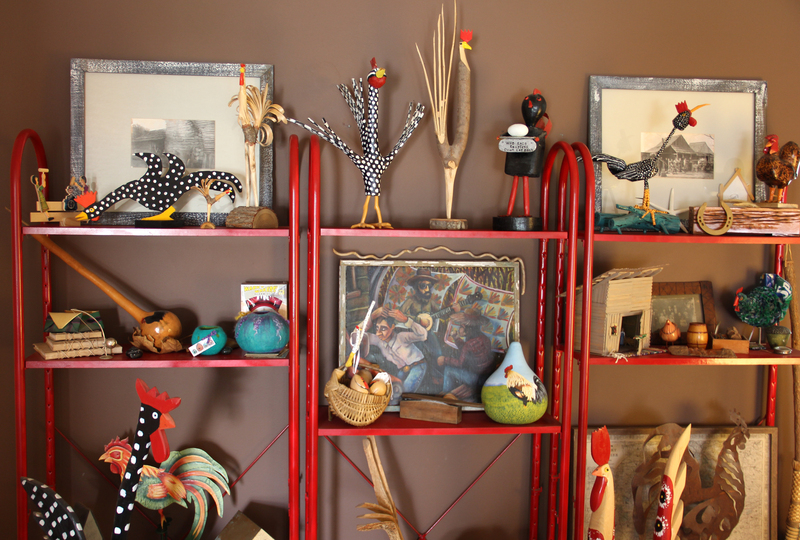 Enjoyed your story of how you got started collecting Folk Art roosters. I started collecting art by going to antique shops and our local Salvation Army Thrift Store. One day at an antique store near Bay Pines I saw an OLD canvas (ripped down the middle) of a yellow hibuscus flower. It had a pricetag on it of (I thought) $3.00, so I decided to buy it (I don’t know why). When I took it up to pay for it, they said it’s not $3.00, it’s $300. Since I had very little $, I didn’t buy it, but I noted the artist’s name was Martin Johnson Heade .Eventually, I went to the library & looked him up. Imagine my surprise to learn that he was a major American artist who had worked in Florida & was known for painting flowers. And so began my desire to first know more about art, then later to begin collecting (mainly by frequenting the local Salvation Army thrift store). Before you discount (no pun intended) the St. Pete SA thrift store, you have to consider a couple of intersting things about St. Pete. 1.) a lot of people come to St. Pete to retire & they bring their collections & decor, etc., with them. 2.) When they die, their relatives must come to St. Pete from up north to settle their estates & they only have a couple of days(usually) to get it done. 3.) The relatives, in many cases, don’t know the value of the artworks hanging on their deceased relatives walls. So, they take or keep what they want & donate the rest to the SA thrift store. If someone were to visit that store every day & especially be there when the ” new” items are put out on the floor, they’d get first crack at the “finds”. I’ve missed some good ones because of my ignorance about the artist(s), but I’ve scored a few too. Mainly though, it’s the excitement of the hunt. It’s like a treasure hunt. Usually, you lose, but occasionally, you win! Chip C.
Very cool post, here in Michigan we have one of the greatest street art fairs every year in Ann Arbor Michigan, where there is a huge range of affordable and collectible art. Notwithstanding the price, its amazing what you can create and discover with some imagination and elbow greese…keep on inspiring the world with art as we need to relish our abilities to create and share beauty with others !